But with the release of Windows 8 and later versions, the upgraded Windows users are facing some problems with this modem. The modem Micromax MMX 352G is not working on Windows 8 and later due to its incompatibility. The modem drivers are not installed on Windows 8. But don't worry, because I am going to share a trick with you by which you can use your MMX 352G 3G USB Modem on your Windows 8 or Windows8.1 or Windows 10 PC. Open the folder containing the installation files. Now run ShowModem.exe and install the drivers. After the installation, restart your PC. Connect the modem to your PC and run MMX352G 3G USB manager and it will show ‘No Device’. But don’t worry, the original trick starts from here! 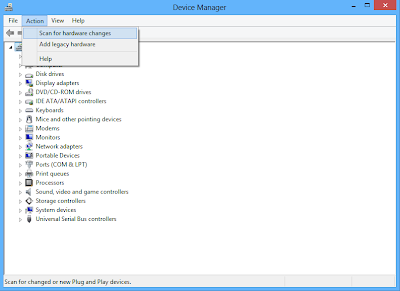 Now open Control Panel >> Device Manager, then under Other Devices, just uninstall all the drivers related to the modem. 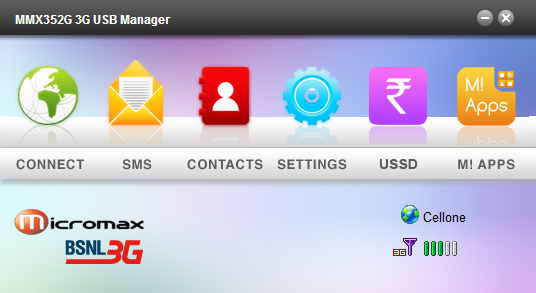 Now run the MMX352G 3G USB manager installed in your PC, it will definitely work this time. Then connect to internet using your MMX 352G USB Modem and enjoy! The above trick will work on all the editions of Windows 8 or 8.1 (Windows 8 Pro/ Enterprise/RT 32bit & 64bit) and may also work for MMX 353G model. Then install the setup file, if it shows 'Install Drivers...FAIL! ', don't worry. It will prompt for a restart then restart your PC. Now run the modem software, it will show network. Tested by the contributor and its working. Uninstall the drivers of devices having yellow marks under Ports (COM & LPT) i.e. Device Application Interface, Device Diagnostic Interface and Device Pipe. Then go to Action>Scan for hardware changes. If again some devices appear with yellow marks, uninstall their drivers and scan for hardware changes. Restart your PC (Optional Step). Then open the Modem Software; your MMX352G Modem will be detected this time. This method is also working on Windows 10. So follow the guide and do give the feedbacks. Hey Nikhil, first uninstall the software and its drivers and follow the steps carefully again. if still doesn't work let me know. hey i follow this proceduer and then not worked properly this device. hey Suman, where are u getting the problem? its not woring for me/. विंडोज 8 में इनमे से कोई भी ट्रिक काम नहीं करती है, चाहे कुछ भी कर लो ...लेकिन विंडोज 8.1 में यह समस्या अपने आप दूर हो गयी है ...तो 8.1 में अपग्रेड कर लें .. Hello..Please help MMX310G modem not working in windows 8.1 pro. THANKX GUY .IT IS REALLY WORKING .I APPRECIATE YOUR TRICK .ITS REALLY WORTH IT. You are always welcome. Keep visiting. No other drivers will be shown. Just delete the drivers with yellow mark and scan for hardware changes. Then restart ur PC and run the modem software. It worked......did anybody told you that u r awesome man? i cant save settings of windows 7 in troubleshooting..
my driver installation always show failed.. 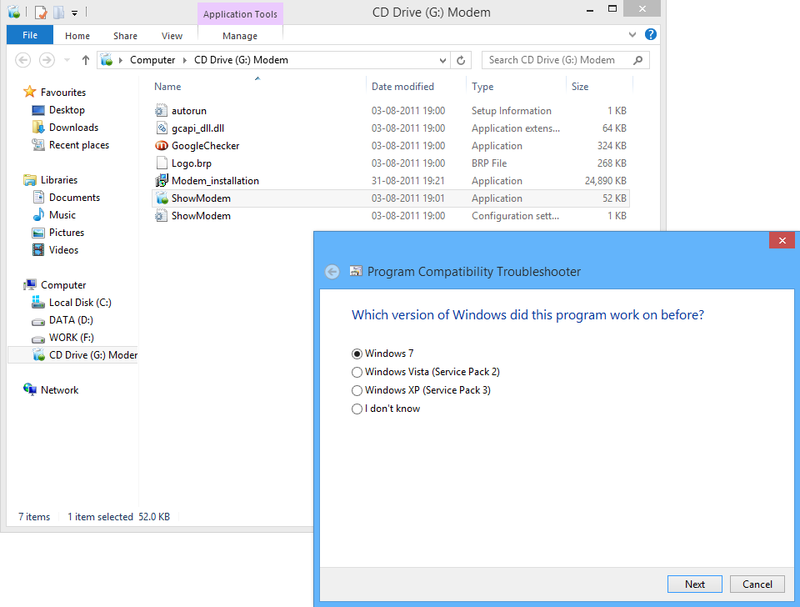 Install the drivers in troubleshoot mode in windows 7. That means the modem drivers software is not properly installed. Reinstall in troubleshoot mode. 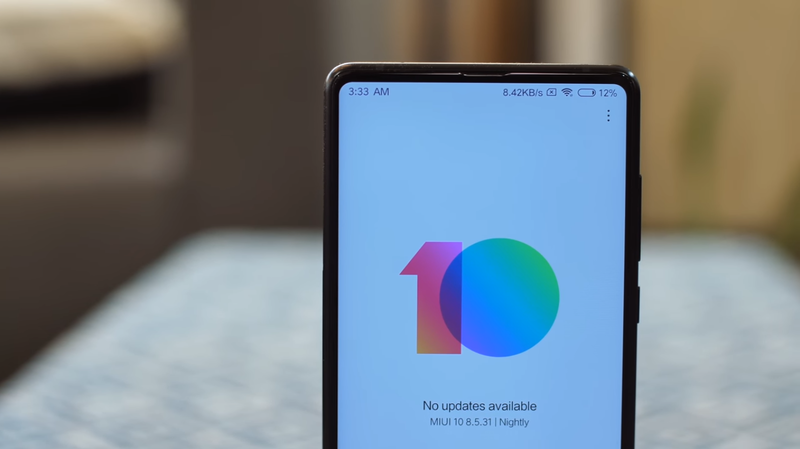 will it work in window 7 again? Yes it will definitely work on windows 7 again. Does this thing works in windows 8.1 too ? It worked in win 8.1 update . I manually updated the driver for each com port and it started working.Still thanks for the help . may i know the steps please! Just update the drivers manually. See the above comment of shivam arora. i connected internet in win8.1 using dlink modem and tried to update drivers of mmx352g manually from win. update but it says driver is unavailable. if its not working then i can't help u more about it. Because I have not tried this trick on windows 8.1 preview. Awesome trick you are really genius god bless you. Every time i connect d mmx modem.. It start installing. And show an error at d end of installation ''installation FALT''... Plz help and after finishing all steps it shows no service. Plz plz help. M using window8... N i had try ur trick. Thank you very much...it is really working. 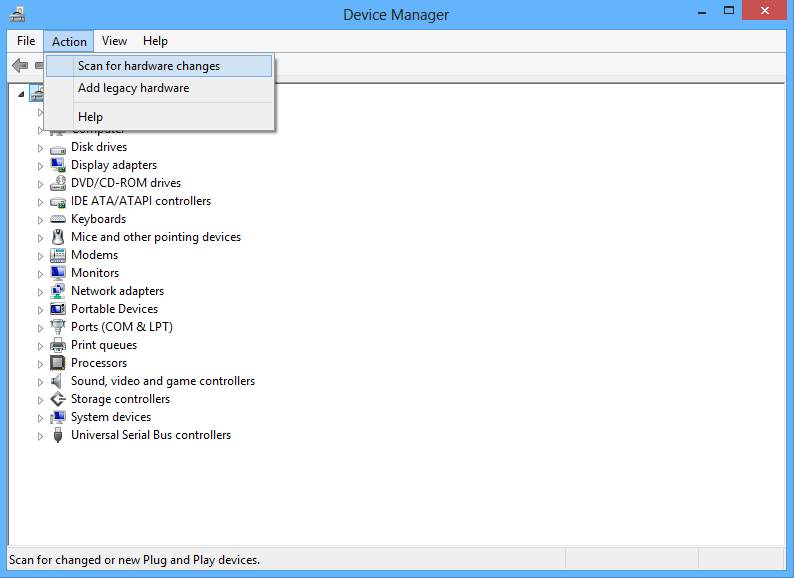 You'll find 'other devices' in device manager after installing the modem drivers. 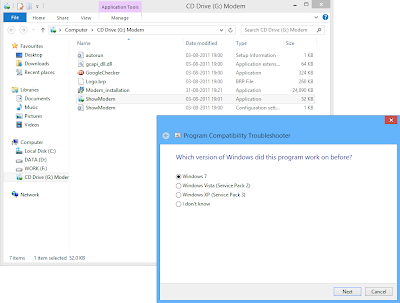 Are u installing it in compatibility mode for win 7 or not? Go to device manager and search for driver updates online. Thanks a lot dear. Its working. Finally i had solve the issue of Micromax MMX353G USB Modem "No Device found in Windows8/8.1" by this simple steps. 2)Install the MMX353G software,it shows Install Drivers...FAIL! and promote you to Restart your PC. here you find the following files and do the following methods. 5)Thats all...run the program you will find that network is searching and Available. Pls....... i need you people's help. Follow the second method, it will work. Then install the modem drivers manually. I have explained it in the second updated method which intended for Windows 8.1. It is the fault of internet connection or your internet settings, not of the drivers. I have done the same ... still not working in my system ... Windows 8.1 64 bit. When I restart Again and open Autoplay it automatically start to install again. Any solution Sir ........ ????? Yes, there is a solution. You start the modem drivers from the icon on your desktop. And disable 'Autoplay' on your system because it may harm your PC, if you insert any infected pendrive (this is for your knowledge purpose only!). Which OS are you using? Follow the second method if the first one doesn't work. Where are you getting the problem? Try to install it directly, not in compatibility mode. Hi.. Its not getting installed.. Please HELP..
Where is the problem? Did you follow the method correctly? I am getting problem in installing driver (micromax dongle MMX352G) in my laptop wins 8.1.I have followed all the from youtube somebody shared there .Like removing sofrtwre from control panel->Then comptability for windows 7 ->then installed ->then restart->then open sofware->no device found->then went to device manager ->other devices->unistall other devices->Action scan for devices.But problem is that after scanning for devices ,the removed devices again comes again.Then i went to C drive where driver is installed ,right clicked on driver folder cmnsmdm.inf,cmnsser.inf installed but there shown ready driver not installed,plese help me sir ,i was trying for last 5 days but not got solved my problem,so today i knoked your door ,kindly help me . You first fully uninstall the whole Modem Software and then follow our Second Method. This newer method, I tried it earlier and my dongle started working. Now suddenly it has stopped working yet again. What shall I do? If some error has occurred then repeat the 4th step of second method, it will start working again. Where are you getting the problem? Try installing in safe mode. Try our second method. It's much easier. It works on both 32bit and 64bit. None of the above tricks is working in Windows 8.1 The problem of no device persists. Please help me. Please try the new updated additional steps for Windows 8.1 users. I am not getting step 3. How to uninstall Modems>Mobile Connector? Its not there.. If it's not there then ignore it. If drivers are shown with yellow marks then you have to uninstall them again. If they are without yellow marks then you are ready to surf the internet. If the method does not work then you can manually update each com&port drivers. Nitesh pls help me to run my Micromax 353G 3G dongle in Windows 8.1, its not working there, i have tried all the steps you have suggested. Did you get Com&Port drivers with yellow mark in Device manager? Where are you getting the problem? Please explain. If you have alternative internet connection then you may try manually updating the drivers of devices with yellow marks in Device Manager. However, I'll update the post with the appropriate method when I'll get Windows 10 upgrade. 2)Install the MMX3G software it shows Install Drivers...FAIL! and promote you to Restart your PC. 3)Restart and change the compatibility mode for MMX210G icon in the desktop same as the step 1. Guys, I don't have Windows 10 so unable to test and find the method. Once I get it I'll update the method to help you. Which Windows version are you using?? Follow the instructions given above. Which OS are you using? Network problem can be related to operator. Damn good idea. Very simple but effective. Now my dongle is working perfect. Thanks Mr.Chourasia,you are great. thanks bro. worked perfectly on windows 10.